Today you need to remember many passwords. You need a password for the network logon, e-mail account, homepage's FTP password, website member account, etc. How can you remember all those passwords? Plato Mac Safe Password Manager is a free and easy-to-use password manager for Mac users to store passwords in a highly encrypted database, and the database consists of only one file, it can be easily transferred from one computer to another. (1). Supports password groups, you can sort your passwords (for example into Windows, Internet, FTP, HomeBack etc. (2). 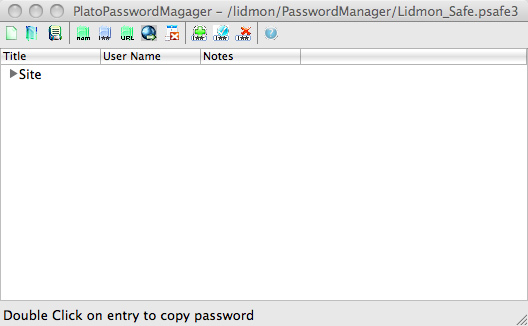 Export the password database to TXT,CSV,XML,HTML formats. (3). Import password from CSV file. (4). Support with a strong random password generator. (5). Consists of only one file, easily transferred from one computer to another. Qweas is providing links to Free Mac Password Manager 12.05.02 as a courtesy, and makes no representations regarding Free Mac Password Manager or any other applications or any information related thereto. Any questions, complaints or claims regarding this application Free Mac Password Manager 12.05.02 must be directed to the appropriate software vendor. You may click the publisher link of Free Mac Password Manager on the top of this page to get more details about the vendor.